Guys, tonight I saw one of my favorite people live in person! Stephen Colbert! It was so much fun and I was so happy to finally see him in action. After snagging some free tickets (had I known these were free I would have gone sooner!) Pat and I waited several hours in line and attended the taping that will be live tomorrow night. The show totally exceeded my expectations. Stephen was hilarious and awesome, and when he came on stage Pat and I were completely freaking out and screaming like crazy people. Also, the band was killer and it was just really cool overall to see how TV shows are filmed and everything that goes on behind the scenes. Plus, waiting in line and making friends along the way was a fun and memorable New York moment! This week has been so busy with after work activities. On Wednesday my friend Lauren and I went to an author event at Fresh for McKel Hill, blogger at Nutrition Stripped (check out her cookbook -it's awesome). With that plus the show earlier tonight, I'm happy that my upcoming weekend plans so far are pretty laid back. I'm hoping to see one of my favorite food bloggers, Molly Yeh, at the Union Square Greenmarket on Saturday morning, and then I have to catch up on some freelance work. I also have tentative plans with my friend Lisette to hang out in Astoria and eat some good food, undecided what yet - hopefully Southeast Asian of some sort. But any food is good in my book. Have a great weekend! Preheat oven to 350 degrees F. Roll out dough onto parchment paper. 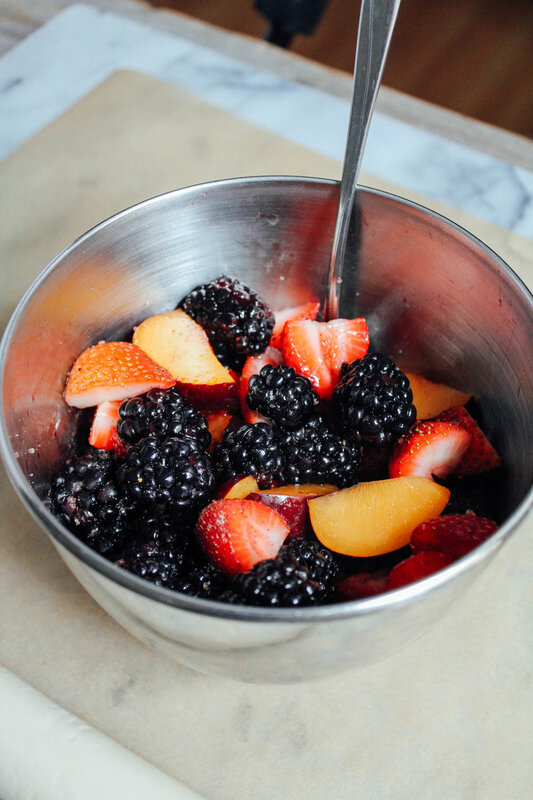 In a medium bowl, toss fruit with lime juice, cinnamon, white sugar together and let sit. For the caramel sauce, heat butter in a small saucepan until melted. Add in sugar and stir until dissolved, mixing constantly. Add in vanilla and flour and continue to mix until it darkens. Add in half and half and remove from oven. Set aside. Pour caramel mixture into center of dough and spread evenly, leaving 1 inch edges around the circle. 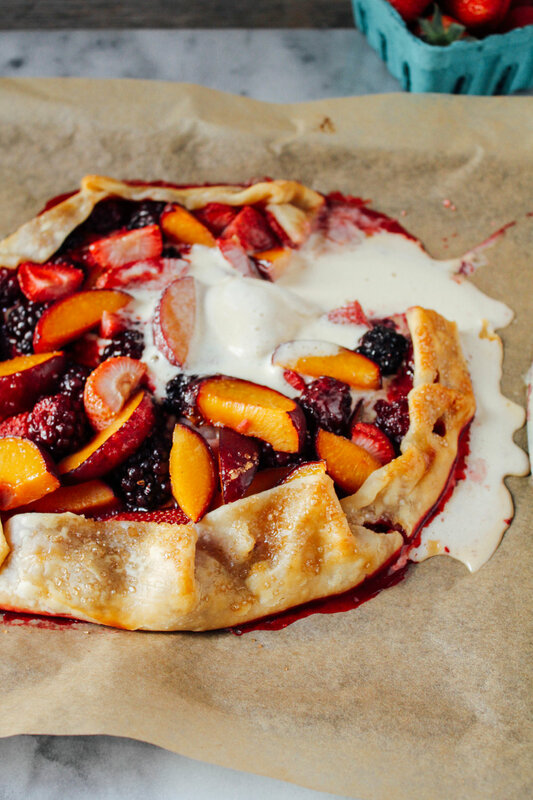 Add fruit mixture into the center of the dough on top and spread evenly, patting down. Fold up sides of dough up so that the fruit is encased. 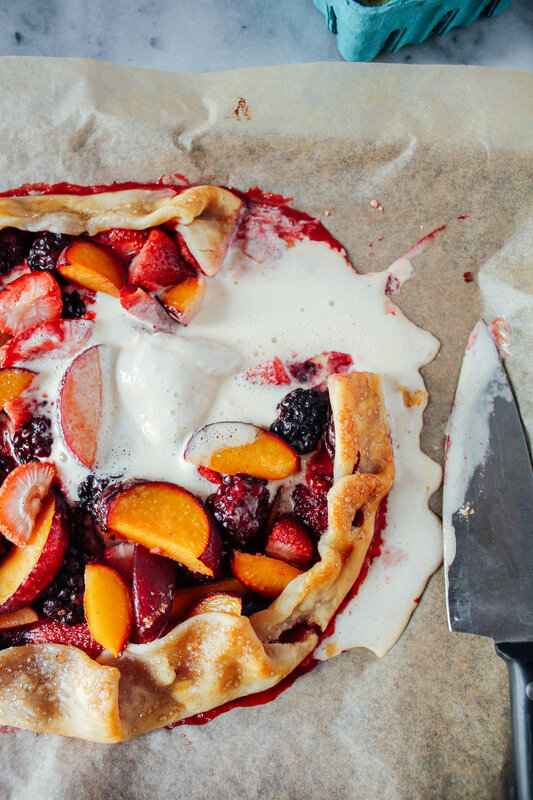 Brush the dough with the egg white wash and sprinkle the turbinado sugar on the edges and over the fruit. Transfer to baking tray and bake for 30 - 40 minutes, until the dough is browned and the fruit is cooked down. Remove from oven and top with ice cream and enjoy!